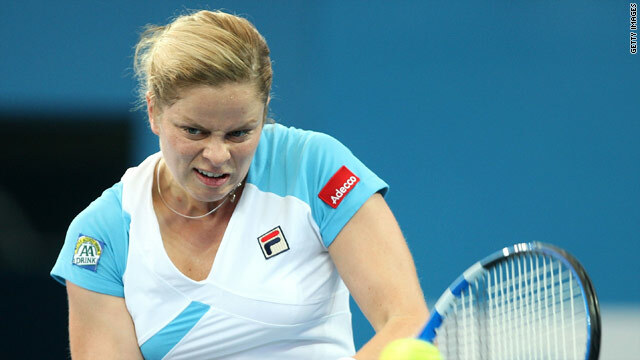 Top seed Kim Clijsters will play her fellow-Belgian Henin in the final of the Brisbane International event. (CNN) -- Former world number ones Justine Henin and Kim Clijsters will contest an all-Belgian final at the Brisbane International after both completed straight-sets semifinal triumphs on Friday. Wild card Henin continued her remarkable comeback to tennis with a 6-3 6-2 win over third seed Ana Ivanovic. Despite having spent 20 months out of the game, it was the Henin of old as she easily dispatched the Serbian in just over an hour. Henin secured the crucial break in the fifth game of the opening set before breaking again to close it out 6-3. The 27-year-old carried that momentum into the second to break again and led 2-0 before Ivanovic mounted a comeback. The Serbian hauled it back to 2-2 but could not maintain it as Henin won the next four games to secure the match. Top seed Clijsters later secured a final date with her countrywoman by sinking German Andrea Petkovic in the second semifinal. The U.S. Open champion, who had almost two years out of the game before returning in astonishing fashion to claim a second crown at Flushing Meadows in September, continued her excellent run of form by disposing of Petkovic 6-4 6-2. Henin played down any talk of a rift with her Belgian rival after clinching her place in the final. She told reporters: "There is so much respect between the two of us. I know sometimes people would love to hear there have been problems between us but that's not the case -- never in the past. "I think I respect the person and the player and it's the same for her. We are so different -- but we have good memories. "It's always a good feeling to play against her because it's always a tough match and it's always a good challenge." Meanwhile, another Belgian, Yanina Wickmayer, has reached the final of the Auckland Classic -- her first tournament since a one-year ban on her was lifted last month. Third seed Wickmayer, who had been suspended along with compatriot Xavier Malisse for missing three dope tests, defeated Israeli Shahar Peer 6-4 7-5. Her opponent in the final will be top seed Flavia Pennetta, who crushed fellow-Italian Francesca Schiavone 6-3 6-0. Elsewhere, Andy Murray crushed Igor Andreev 6-1 6-0 as Great Britain beat Russia 2-1 to claim a place in the final of the Hopman Cup mixed event in Perth for the first time. Elena Dementieva gave Russia a 1-0 lead when she beat 15-year-old Laura Robson 6-4 6-0, but Murray made it 1-1 with his singles win and then teamed up with Robson to beat Andreev and Dementieva 6-4 6-7 7-6. Britain will face Spain in the final, after the two-times former winners secutred the place on Thursday.